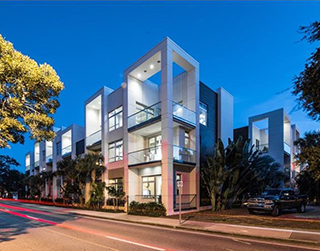 Q is a cluster of townhomes masterfully constructed in contemporary, modern architecture off Ringling Boulevard. These townhouses are the only residential types of its kind amongst Sarasota condos for sale in this cozy stretch of east downtown. This property sits in a two-acre site which is only a block south of Main Street. It has a total of 39 residential condos designed as either two- or three-story units. These residences dominate the Q’s block which is bordered by Osprey Avenue towards east, Morrill Street to the south, and Pine Place to the west. The Q townhouses are standouts in this neighborhood, thanks to their building’s modern urban loft design. 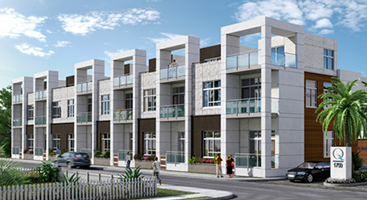 The townhomes’ exteriors are refined and eye-pleasing in their ultra clean lines. A flawless modular design blending mixed materials, including metal, silica stucco and brick, delivers this distinctive look for the Q condos for sale. Complementing these chic exterior finishes, the Q’s townhouses feature terraces with glass railing systems. Each floor of the townhouse buildings were built with these features to allow vibrant cityscape views from the Q’s residences. Other high-quality appointments incorporated in the Q’s buildings include LED exterior lighting and gas-fired, tank-less water heaters. The residential units in this property are flexible and sophisticated in their open floor designs of between 1,600 and 3,980 square feet designed with two to three bedrooms. The prices of these town houses range from the $600s up to nearly $1.6 million. Large windows, 10-foot hurricane-rated front doors and 8-foot solid core doors are but some of the features basic to these condos. 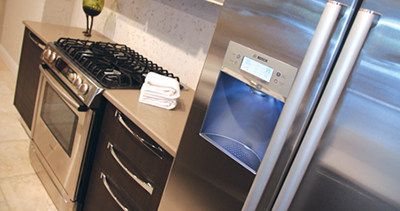 These units further exude charm in their 360-degree spiral staircases with an option for a glass tube elevator. Other appointments are as impressive within these residences. 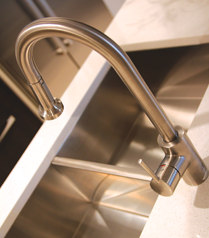 These include high-end Bosch appliances, LUBÉ Italian cabinetry, Duravit Vitreous China sinks, and Hansgrohe plumbing fixtures. Q’s condos also boast of porcelain tiles and carpets, large walk-in closets, Caesarstone® countertops, and modern, free-standing tubs. In addition, each townhouse come bundled with private one-, two- or three-car garage parking plus spacious storage. Their walkable location makes Q townhomes a likely choice of young urban professionals, retirees, and snowbirds seeking downtown Sarasota condos for sale. The Q scores 93 out of 100 in walkability, which is hardly surprising with its convenient downtown location. This condominium complex is only a short walk east to the charming Towles Court, an artists’ enclave featuring galleries, antique shops and restaurants. Every third Friday of the month, this artists’ colony holds an art walk featuring music and entertainment at the open houses in its studios and galleries. Also a short distance east of the Q, a tennis center with well-maintained courts at affordable fees is easily accessible at the 29-acre Payne Park. This popular park also features a Frisbee golf course, a skateboard track, biking and walking trails, a circus-themed playground, and a café. A wide range of shops, restaurants and other lifestyle venues are within easy reach from the Q as well. 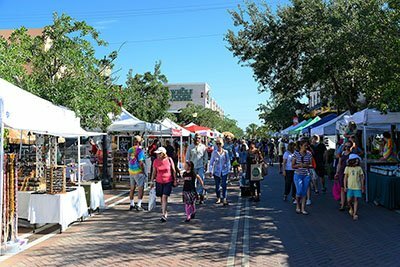 These include not only those at the city center but also extend to commercial establishments at St. Armands Circle and the beach playgrounds of Lido and Siesta Keys.